Consider the Translation // The best Bible translation is the one that people will read. Every translation is an interpretation of what the original texts say. You might have a personal bias toward one translation but you should encourage people to explore a handful of translations and find the right “fit” for them. Resist the temptation to be dogmatic. In a world where people have access to an unlimited amount of information in their pockets, you will come off as narrow-minded if you push one translation only. People know there are multiple translations so help them navigate and celebrate the nuances in them. Encourage them to settle on a modern translation that works best for them. 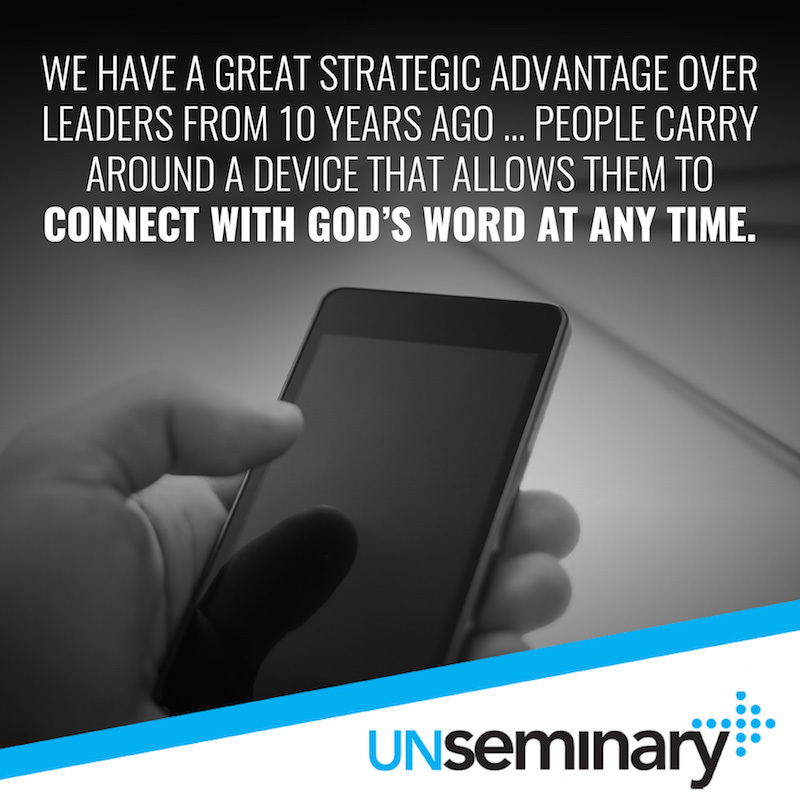 Encourage Digital Versions // We have a great strategic advantage over leaders from 10 years ago … people carry around a device that allows them to connect with God’s word at any time. The YouVersion Bible app continues to be the industry-leading free Bible app that you should encourage people to use. It used to be a rare person who would take a Bible with them throughout their daily routines because they feared being viewed as “Bible thumpers.” Now Christ-followers can take the text with them and access it anytime in a discreet way. 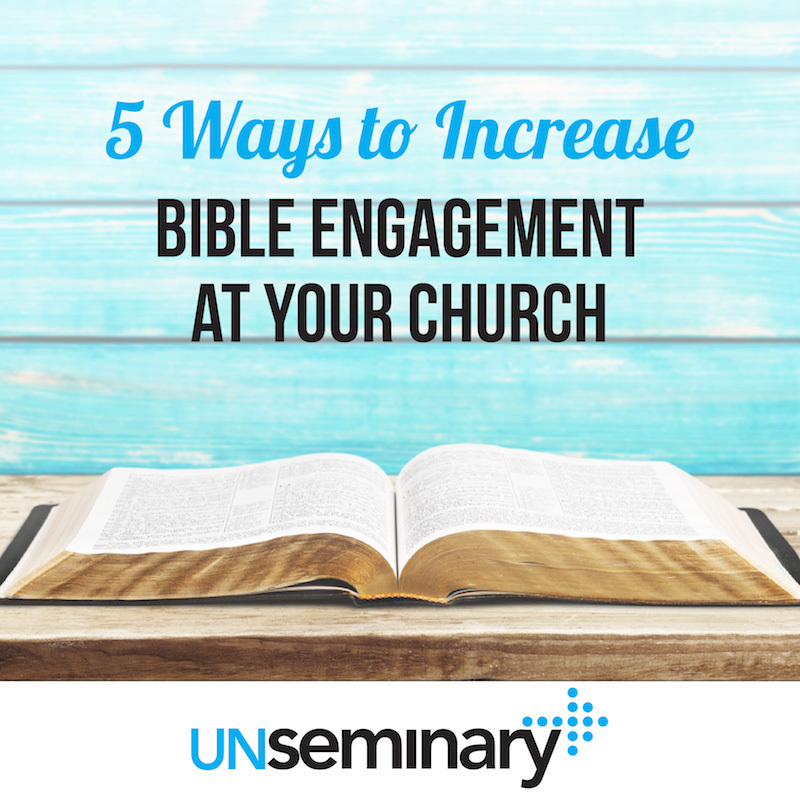 Use a digital version on Sundays in your services and teach people how to take advantage of it. Make it Shareable // You probably use key verses throughout your messages and at your services. Share those verses throughout the week on your various social media channels. Check out Insta.Bible for quick-to-share social media graphics that you can plug and play in your networks right away. They have an expanding number of graphics ready to use from all 66 books of the Bible! If you’re looking for something a little more custom, use a service like Design Pickle to make graphics that closely align with your church’s look and feel. Ask People to Use Them // Slow down at your weekend services and ask people to take out their Bibles and use them. Whether they use their phones or turn the pages, get them to look up the text. For some people, this is the only time during the week when they will interact directly with the Bible. This training is a small thing but it’s an important tactic to engage people. Think through how you’re going to use text on the screen in your services. It is a powerful visual cue to help people engage with the message. Ensure you’re using it in a way that augments people actually looking at their own text. I’ve heard so many church leaders bemoan that people don’t know their Bible, but these same leaders put all the scriptures on the screen instead of leading people to use the text! Community Bible Experience // I’m a big fan of Biblica’s Community Bible Experience, which leads churches through a 40-day plan to read the entire New Testament. This approach encourages people to “read big” for five days a week and go through about 12 pages to get an amazing overview of the story of God in the New Testament. A number of years ago, we kicked off the year as a church by doing this campaign. It was incredibly powerful to work through the text together. All of our groups, kids and students focused on the same passages, which created great synergy in our community and encouraged us to listen to what God was saying to us. 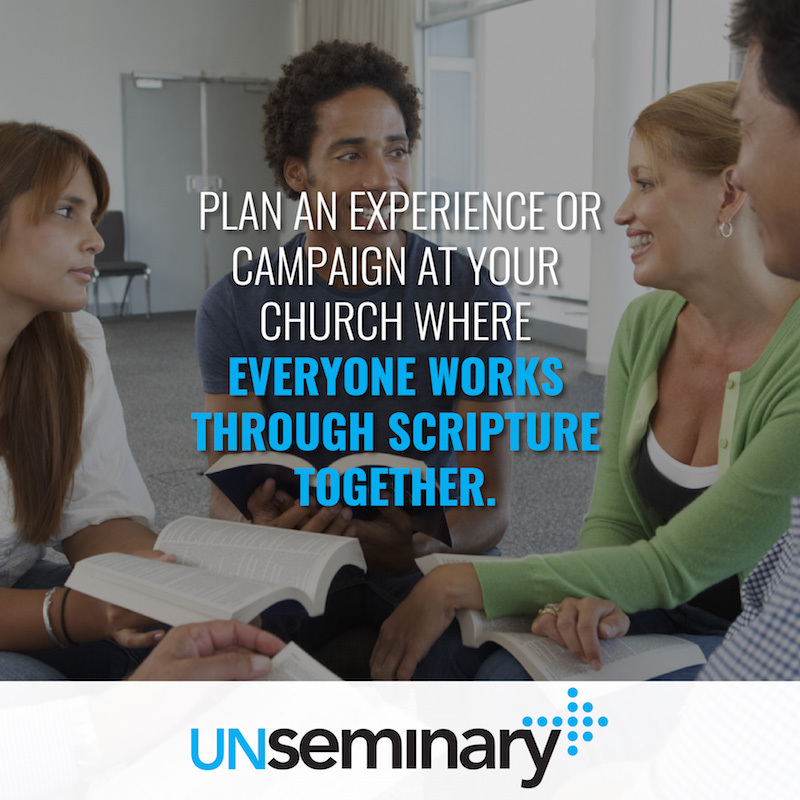 Whether it’s this campaign or another, I strongly recommend that your church plan an experience or campaign where everyone works through scripture together. Bonus: Be Nice // Here’s the hard truth: most of the people in your church don’t read the Bible and they feel awful about it. They feel like hypocrites and failures. They need you to love and care for them and help them become more engaged. You love reading the text … that’s great. Most people are confused when they open up the Bible. Focus on tangible next steps for everyone and acknowledge that it’s a big shift to get them to do anything. Put the cookies on the bottom shelf and then guide them. It’s called being a shepherd … don’t beat them up for being sheep … lead them. Rich this is pure gold as usual. I especially love the 3rd one – we need to encourage our people to play with their phones in church! We have printed calendar charts for reading your Bible through the school year. At random intervals we would reward those up to date. At the end of the year those who completed the program went on a dinner cruise. It created a group that still reads their Bible daily 20 years later.